We have a week off from school every February. Last year we traveled to Africa for a safari, but in general, my preference is to book a trip no more than 2-3 time zones from California – it simply makes it easier to re-adjust when school starts again. Hawaii is always an option, except that our favorite hotel there is no longer kid-friendly, and we just traveled to Mexico two years ago. This year I had my eye on Central America. My first choice was actually an eco-resort in Nicaragua. 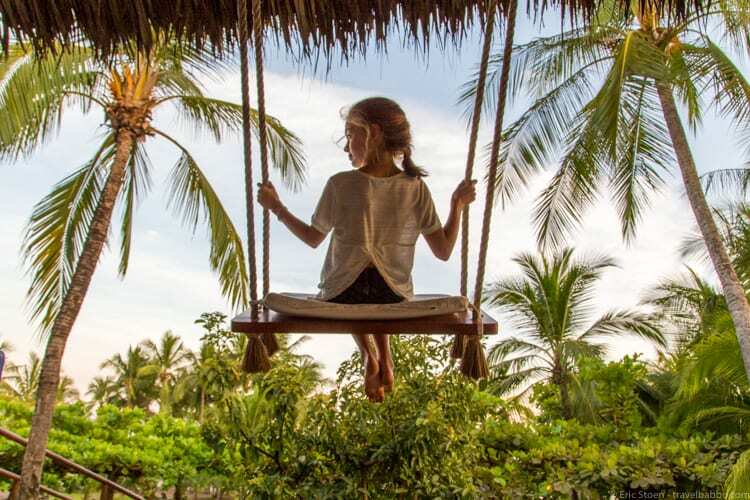 It looked amazing, but the pricing on the website was different than the pricing when I emailed them, and I didn’t like that they charged an additional fee for each child, whether we were staying in one bungalow, two bungalows or a two-room villa. It wasn’t all-inclusive, yet they were essentially penalizing us for bringing the kids. That’s not family-friendly and not a policy that I can support. So we started looking at exploring Costa Rica with kids. The Hotel Punta Islita immediately jumped out at me. 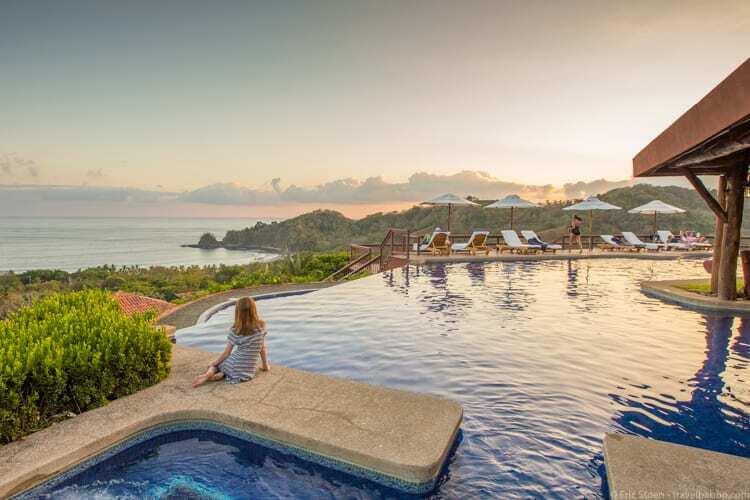 It was far less expensive than the lodge in Nicaragua, and less than we’ve paid in Hawaii or Mexico (two-bedroom villas start at $570+ a night and three-bedroom villas at $670/night). There are inexpensive non-stop flights from Los Angeles to Liberia. 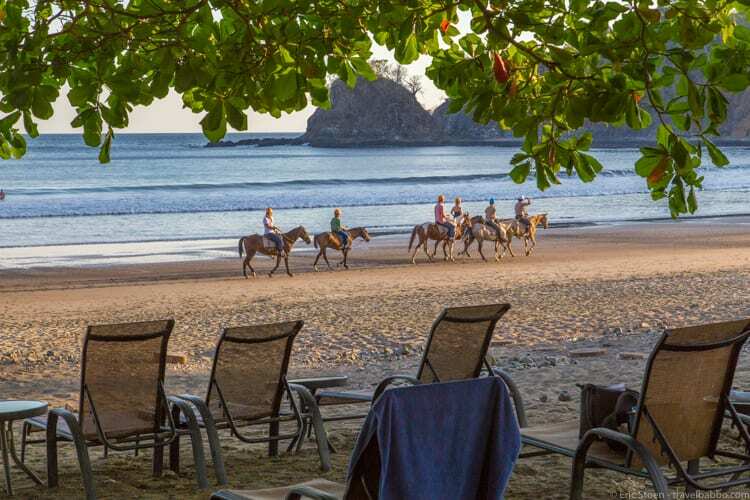 Plus, they have the coolest selling point that I’ve seen at a resort: virtually all activities are included, from horseback riding to yoga to zip-lining, all without a Resort Fee. 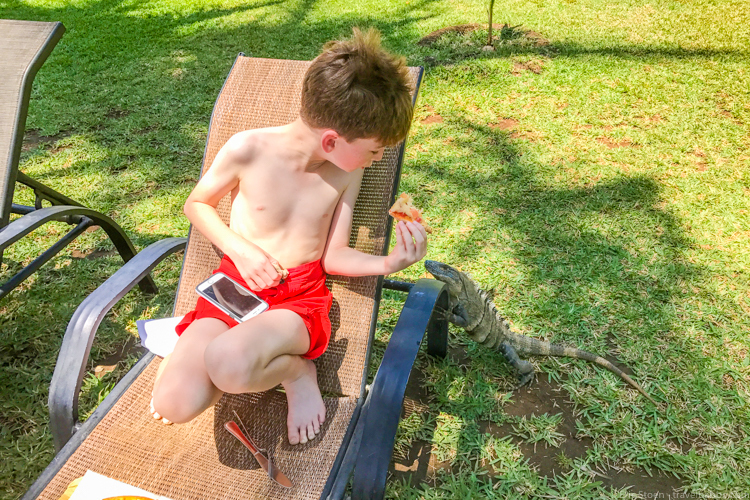 I booked the Hotel Punta Islita in January and we headed off in February for our Costa Rica with kids adventure. We landed in Liberia and quickly went through immigration and customs. Since we weren’t planning on moving around and all the activities were near Punta Islita, we decided against renting a car and instead booked round-trip transfers through the hotel for $360. Our driver was waiting for us, we loaded up, and two hours later we arrived at the hotel. Check-in at Hotel Punta Islita was fast, but we immediately started to have second thoughts about the hotel when we were led to our villa in the dark, down the stairs. A lot of stairs. 196 stairs to be exact. The villa was perfect for us through – a master bedroom with a king-size bed, a second bedroom with two double beds, a large central living room, a kitchen, and a private pool – and we quickly unpacked and then walked 196 stairs back up to the main building to have dinner. Then back down 196 stairs to bed. The next morning we headed back up the stairs for breakfast and then started booking activities to explore Costa Rica with kids. All activities have limited availability, and the resort was full the week we were there, but we were still able to reserve almost everything that we wanted. We booked yoga two mornings for my wife and 11-year-old, a candle-making class for the kids, zip-lining, a morning horseback ride for three of us and a monkey hike, and also arranged for mangrove kayaking for my son and me (not included) and a sunset excursion to the top of a nearby mountain for my daughter’s seventh birthday (not included). Then we headed to the beach. 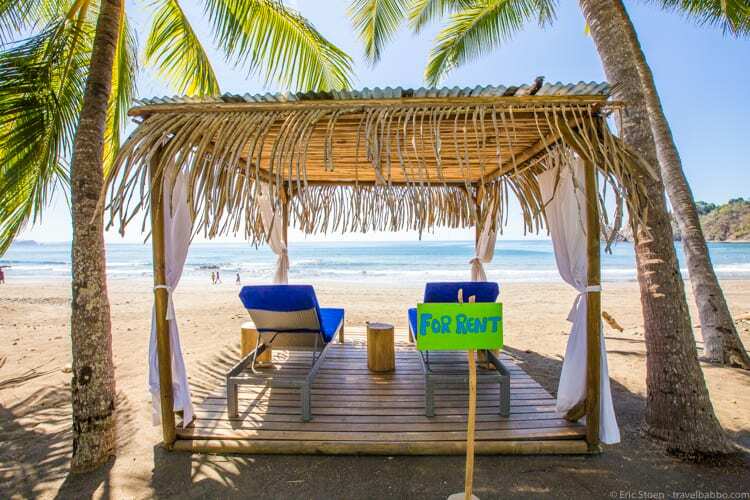 The beach setup is absolutely perfect if you’re visiting Costa Rica with kids. There’s a pool with a swim-up bar, a lot of rentable cabanas, more than enough chairs and hammocks and, most importantly, lots of shade. We were easily able to get five chairs every day and find a shady place to base. The kids split their time between the pool and the hammocks and played at the beach a little every day. There are also two vendors nearby with boogie boards and surfboards for rent, and they both offer surf lessons. My 11-year-old learned how to surf with Elder at Chillasana – $50 for a two-hour lesson. The food at the beach is excellent and reasonably priced. Non-alcoholic drinks are $3-4. Chicken quesadillas, with homemade tortillas and lots of guac, are $11. My wife and daughter loved the yoga and wished that it was offered every day. We really wanted to do a sunset ride with all five of us, but given that there are only eight horses and it’s a popular excursion, it’s difficult to get five of the slots on a busy week. The morning horseback riding was easier to reserve, and my wife, 9-year-old and 11-year-old went. My wife and kids all ride horses several times a week at home, so they know what they’re doing. They gave the ride a moderate thumbs up. 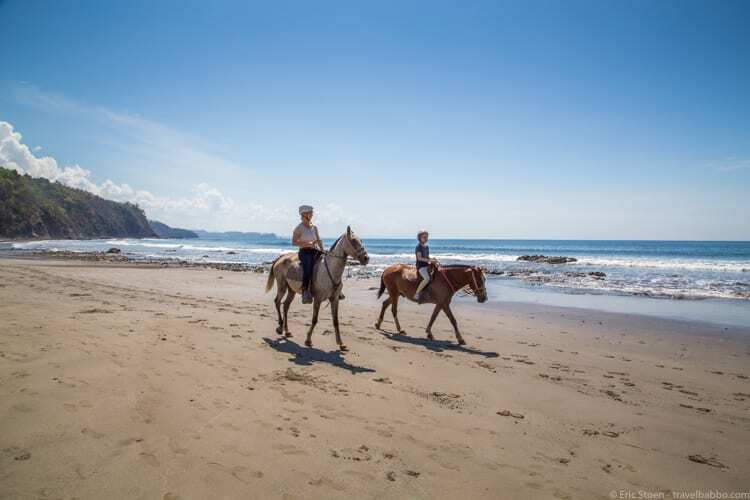 My son loved the beach portion but wished that they were on the beach more than a few minutes – most of the riding is on scenic trails around the resort at Punta Islita. The feedback I got is that this would be excellent for inexperienced riders coming to Costa Rica with kids. My son and I were picked up at the resort on Punta Islita along with eight others and driven 20 minutes away to a starting point. We then kayaked maybe 45 minutes through mangroves to the ocean, took a break for 15 minutes, and kayaked back. I really enjoyed the kayaking. My son didn’t, but he never likes really hot outdoor activities so our noon-2pm time slot (timed with high tide) was about as bad as it gets. I’d still recommend this even if it’s the middle of the day, but kids may enjoy an earlier or later departure more. My wife took the three kids to candle making in town (there’s a small town a 10-minute walk away) for a unique activity. It’s all arranged by the resort at Punta Islita, and the resort drives you to and from town, but it’s run by a local art studio/gallery. The process involved forming black sand into molds, hollowing it out, pouring hot wax in, adding a wick and letting it cool. All three kids LOVED this activity – they say it was better than anything they’ve ever done at a kids club. Elder at Chillasana was an excellent instructor. My 11-year-old joined another child and an adult in a lesson, learned the basics, and was on the water in around 45 minutes. She surfed for an hour and 15 minutes, with Elder in the water to assist, and consistently got up onto her board, riding waves into shore. She’s not sure if she wants to be a surfer, but she loves that she now knows the basics and knows that she’s good at it. FYI, her legs got really burned while in the water, despite the sunscreen we applied in advance. A friend of hers at the resort had the same thing happen. I should have dried her off and reapplied halfway through. Pretty good for a first-time surfer! Roughly 30 minutes before sunset, a driver picked us up and drove us basically straight up a nearby mountain. The drive was only 10 minutes and the kids loved bouncing around in the car! The view from the top was gorgeous, and the driver brought out cava for us, drinks for the kids and a cheese plate. Then, right at sunset, he brought out a birthday cake for my daughter that the resort chefs had made. 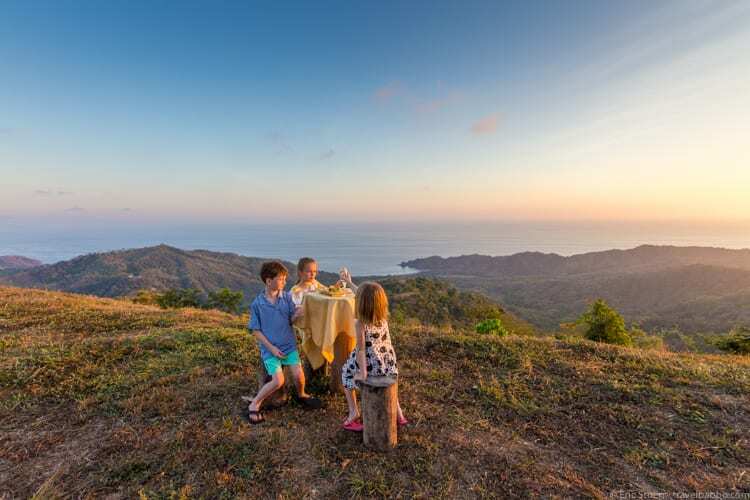 The cake was excellent, and it made her birthday – in a spectacular setting complete with howler monkeys. She now wants to spend every birthday doing the exact same thing! This was the best activity that we arranged all week – I’m so glad the hotel suggested it to us. We made a reservation for all five of us to go zip-lining, but my seven-year-old got nervous when we were about to leave. She doesn’t love activities where she’s not in control (e.g. roller coasters or Class III rapids), so despite reassurance from hotel staff at Punta Islita that far younger kids have gone zip lining and loved it, she was out. The other two kids and I got put on harnesses, hopped in a car with 10 or so others and drove just a couple of minutes to the first platform. There are six lines total that send you over valleys near the hotel, slowly getting closer and closer to the hotel so that by the time you complete the last line, it’s a very short walk back to the lobby. 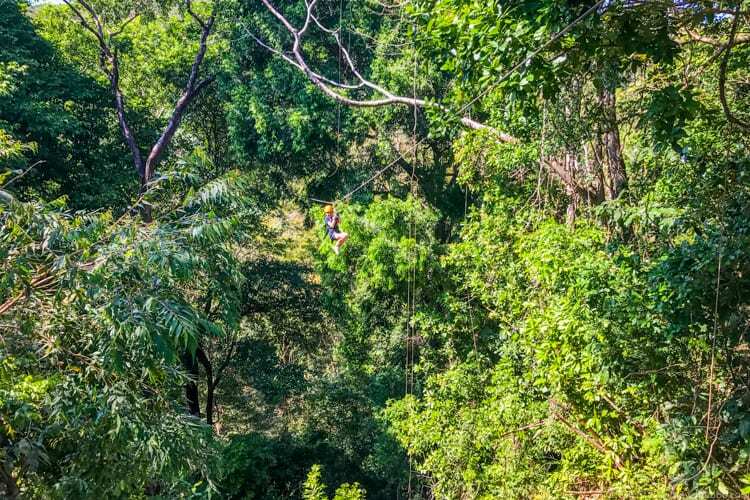 We all loved it – it’s perfectly constructed and great for people who haven’t zip-lined before – or even those who have. The monkey hike is hit-or-miss. 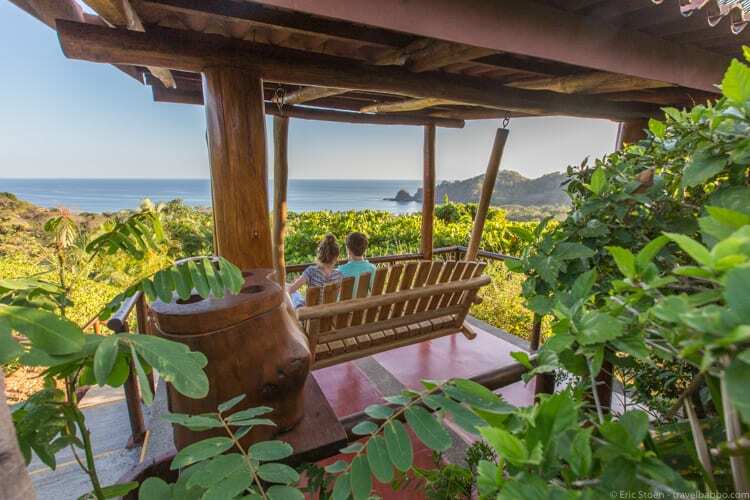 You set out from the lobby at Punta Islita with a guide and a telescope and walk in whatever direction the guide decides (based on intel from others around the property) and hope that you find some monkeys. Our guide took us down the main driveway, across the beach/town road, and then up a hill to a small construction site. Amazingly charming and natural? No. 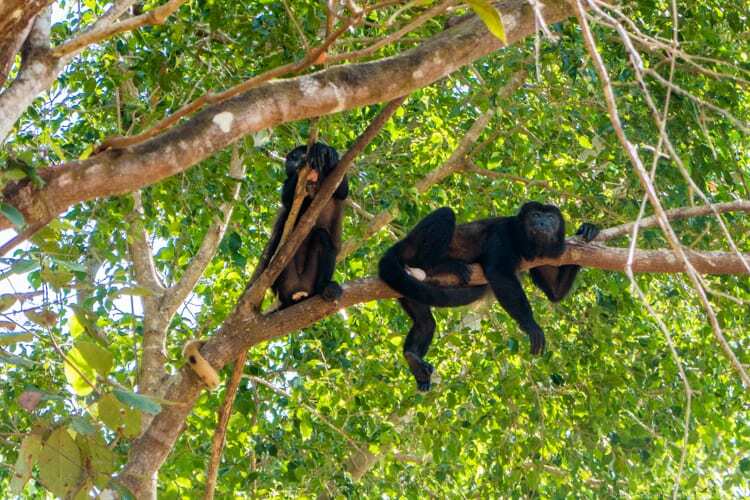 But we found a group of trees with at least 14 howler monkeys, and likely many more given how small some of the babies were. Most monkeys were sleeping, but several babies were leaping from branch to branch, and at one point the monkeys all howled loudly in unison. My kids loved everything about it, and say that it was their favorite activity. We talked to others at the hotel who never found any monkeys on their hikes, though, so some luck is definitely required. The activities that we didn’t take advantage of were evening horseback riding (full), bird watching (too early), golf (no interest), cooking lessons (ceviche was the only option) and hiking at dusk (too close to dinner time). As it was we felt like we had a good schedule – two activities virtually every day and lots of beach and pool time. We’re normally very interested in cooking classes and would have done that if there were options other than ceviche. 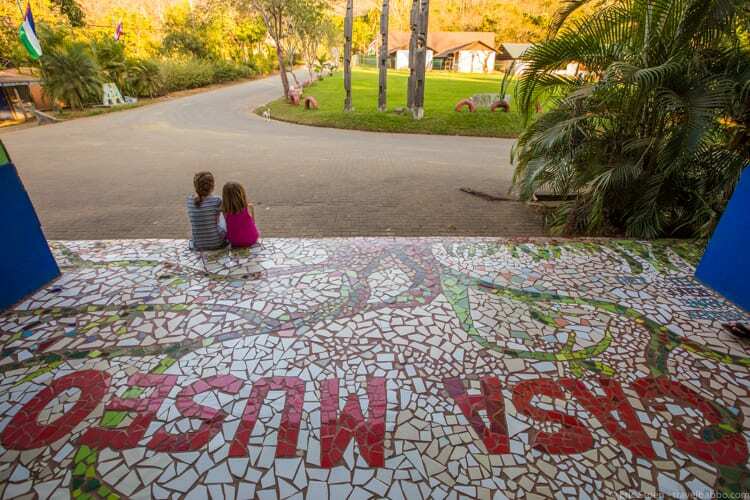 My kids really liked the zip-lining, the monkey hike, candle making, and yoga. We all loved the beach and pool area. The swim-up bar was fun and very kid-friendly, and the prices were excellent. We didn’t mind the kids taking full advantage of our open tab every day, given that Hotel Punta Islita’s mint lemonades (the kids’ favorites) were only $4. Lunches were excellent at the pool/beach, but not quite as good at the restaurant off the lobby. 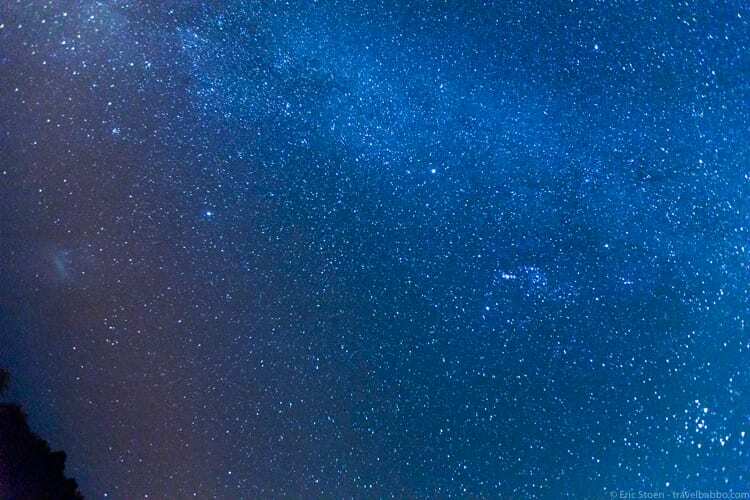 The stars at night are AMAZING! I didn’t take a tripod and we didn’t have a telescope (all villas should come with telescopes! ), but I set my camera on my flip-flop on the beach and took this one 30-second exposure. A lot of nights we would walk back to the villa from the beach (across the closed golf course), stop and look up in awe. My kids also loved the hermit crabs in Punta Islita. They found a few during the day, but the crabs really come out at night – thousands of them. It’s one of the reasons that the kids wanted to eat at the beach every night. The iguanas throughout the resort and on the path through the golf course were fun as well, and we loved seeing scarlet macaws flying around and in the palm trees at the beach. Every day we stopped at the bar above the beach to swing – so fun for the kids. 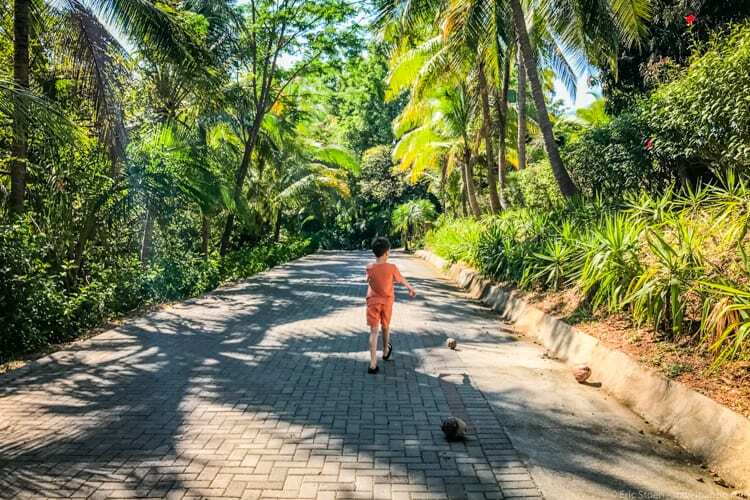 And my son invented coconut bowling along the main driveway (when cars weren’t on the road of course). It was one of his highlights of visiting Costa Rica with kids! And I was impressed that every night after dinner at the beach the staff would bring around marshmallows on skewers, which the kids would then roast over a small fire on the beach. A nice touch when visiting Costa Rica with kids. 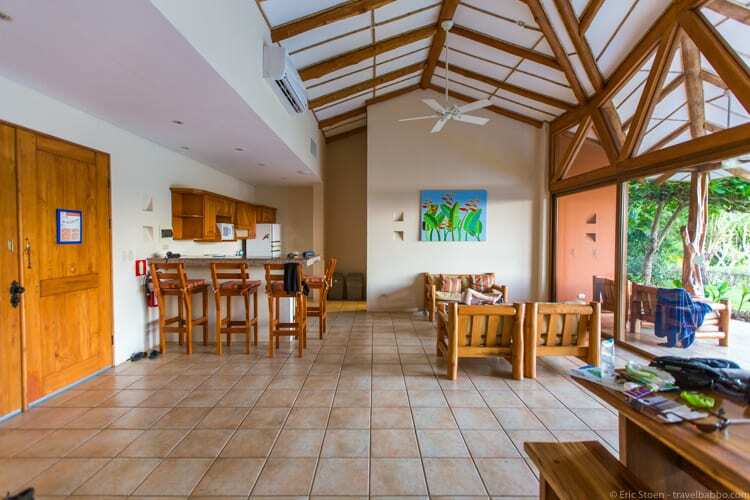 Our villa at Punta Islita was excellent – perfect for a family of five. We never used the kitchen, but the kids played in the plunge pool every day. We all slept well. Did I mention the stairs? In all fairness we could have called for a ride anytime we wanted, but we chose exercise instead – even when the kids complained. The lobby and breakfast were 5-7 minutes straight up the stairs. The beach was a 5-minute walk through the golf course from our villa. Several villas come with golf carts. I wish ours had! We wouldn’t have used it all the time, but it would have been great to have the option. There are a couple of water stations with swinging benches along the stairs – made the climb a little easier. We also would have loved a small espresso / Nespresso machine in our villa, instead of packaged coffee. 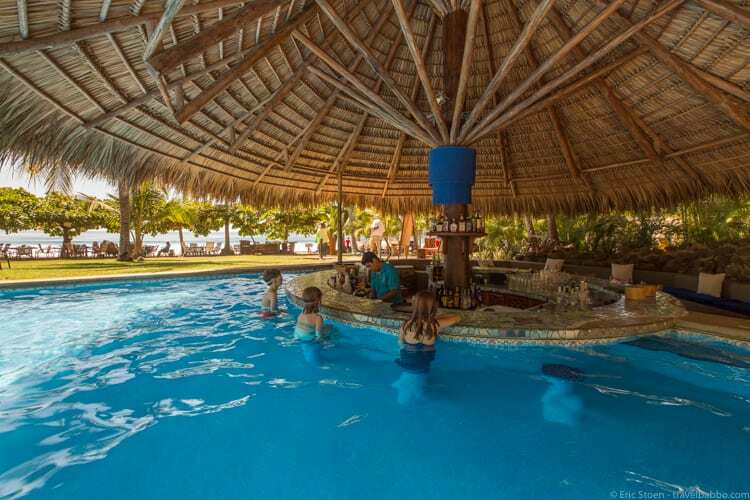 The Punta Islita hotel is one of the family-friendliest hotels that we’ve found anywhere, and I heard the same thing from other guests, including some with teenagers. I’d highly recommend staying a week to fully take advantage of the included activities. 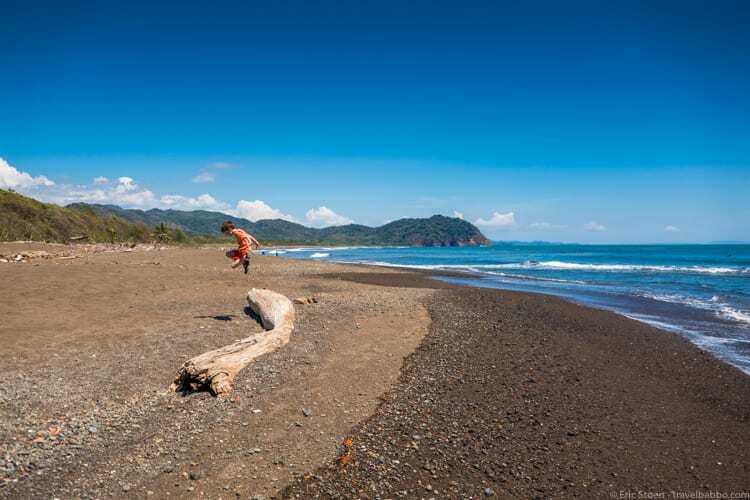 Costa Rica is extremely kid-friendly. 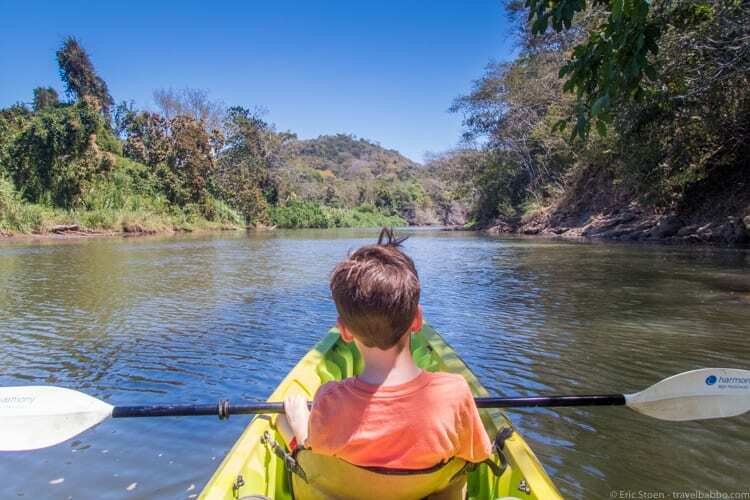 Definitely go and explore Costa Rica with kids. 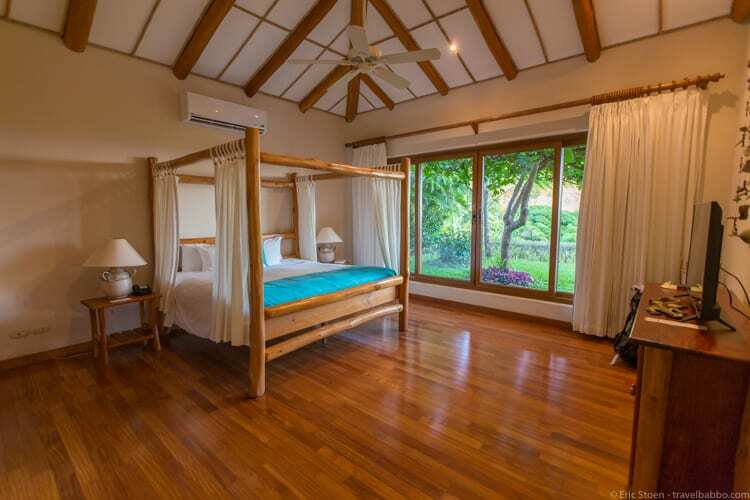 There is a wide range of room options at Punta Islita, and as I said the villas start around $570/night. We spent almost exactly $200/day on food and drinks – roughly 2/3 of that at dinner. Breakfast was included with our villa. Flights from LA are generally $400-500 round-trip. The craziest expense was the Players Cafe at the Liberia Airport- over $100 for a small breakfast for the five of us. I highly recommend avoiding airport dining if at all possible. This was our second trip exploring Costa Rica with kids. The first time we based out of the Marriott Los Suenos in Herradura and explored around there, including Manuel Antonio park. 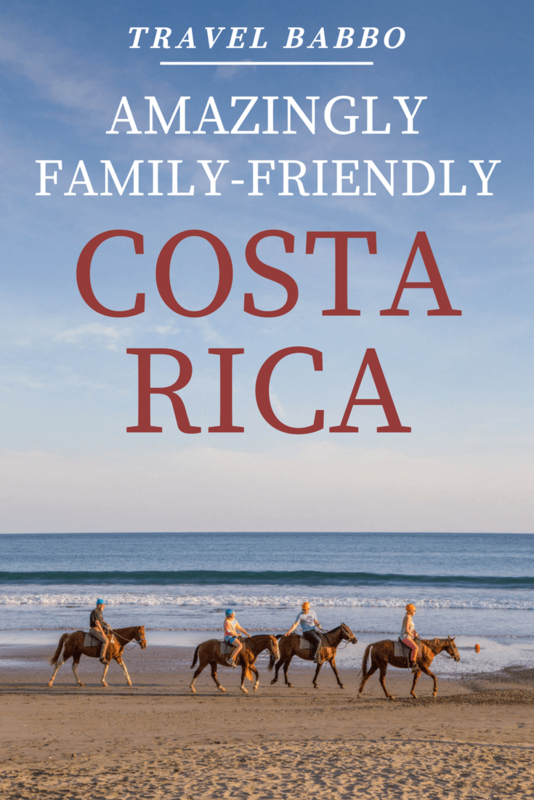 If you’ve been to Costa Rica with kids, please let me know your favorite places! Fabulous review. 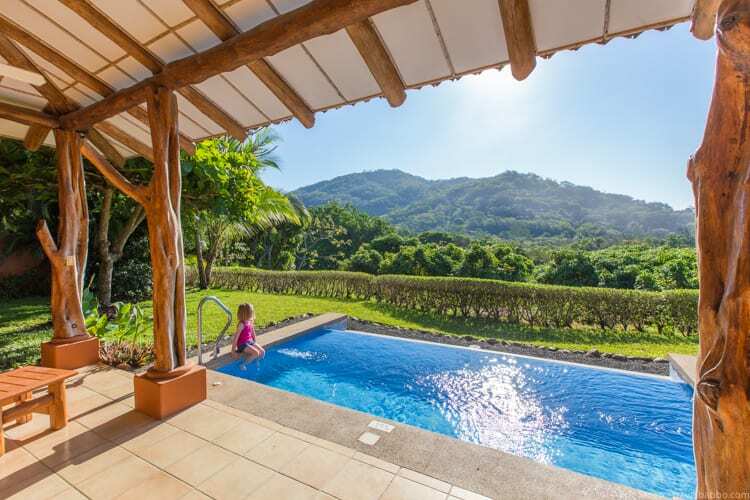 Costa Rica isn’t on our hit list at the moment but with such a awesome kid friendly resort one has to ask themselves, why not? Loved the details and images. Yes, your review of Punta Islita was awesome. We traveled there for spring break 2017 and it remains my favorite vacation destination. The only downside was the distance from airport to the resort. The 2 lane highways made the drive seem longer than it actually was, but that was the only commute issue the entire trip. The staff were awesome – the best!! I highly recommend Punta Islita for the entire family! Agree on everything! The drive is annoying, but after seeing news of the plane crash out of there recently, the drive all of a sudden didn’t seem as bad. 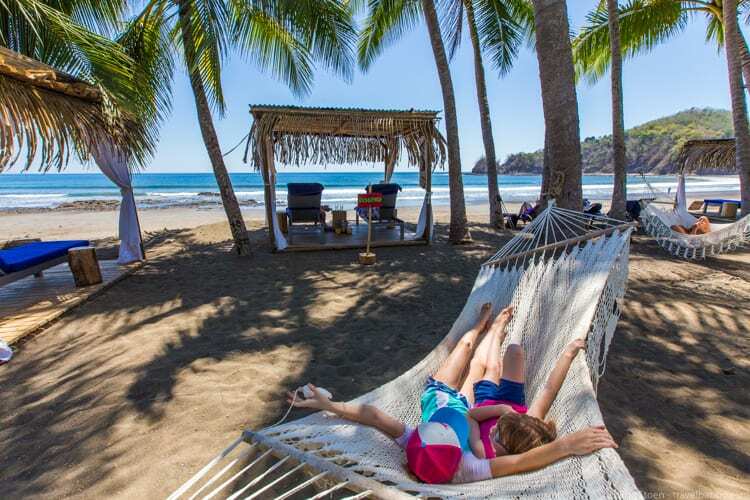 We’re heading to Costa Rica in August with our two young children and staying near Manuel Antonio. It’s supposed to be kid-friendly. I’ll let you know if it lives up to the description! Keep me posted! 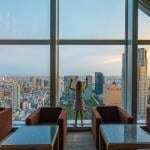 I want to find as many amazingly-kid-friendly places as possible! Thank you so much for this thoughtful, comprehensive review. We are in Los Angeles also, and I love all non-stop-flight-vacation ideas. We will quite possibly duplicate your itinerary here! I also very much appreciate all the cost breakdowns and the blow-by-blow aspect of your reviews – really helps with planning. Please keep writing! Thanks Elena! I’m always trying to find good travel options within five hours or so of LA – basically the same flight time as Hawaii, but not Hawaii since I get a lot of emails from people in California searching for alternatives. This is a great option. We’re the activities included in the 500 room rate? Or did you buy an all inclusive activity package on top of the room rate? Looks like an amazing hotel. Thanks for sharing. We just came back from Belize with a 3 and 5 year old. The weather wasn’t on our side (windy and rough beach) and I don’t think that there were too many young kid, non beach alternatives. Likely will try again when the youngest is 10. We might try Costa Rica next! All activities except for the kayaking and sunset mountain top experience were included in the room rate – that’s what I find so cool. When my daughter was 4 I took her to Belize and I didn’t really enjoy it. We all like Costa Rica far better. looking at this option, as well as your discretion of rosewood mayakoba. how would you compare the two? looking for something christmas 2017, so know rates are going to be quite high around that time! any thoughts about where to go that’s warm, a 5-6 hour flight from NYC area and kid friendly (our youngest is 4)? Great question, so I asked my kids. 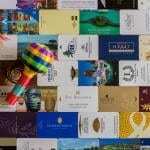 I had two votes for Rosewood Mayakoba and one for Punta Islita. 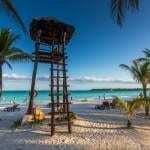 All things equal, I think I’d go with Mayakoba – I loved the bicycles and there was a little more to do, since you have Playa del Carmen and even Cozumel to work with too, plus the ruins of Tulum and Chichen Itza. Mayakoba is flat, so that would be easier with a 4-year-old, plus it’s easier to get to / closer to a major airport. If Rosewood is too expensive at Christmas, check some of the nearby hotels. I spoke with a rep from Fairmont Mayakoba at the New York Times Travel Show and he said that they’re even kid-friendlier than Rosewood! I haven’t been yet, but I’m eager to check it out and see if that’s true. But you can’t go wrong with Punta Islita, and I would think it would be less expensive than Rosewood most of the time. Arenal and Monteverde are such beautiful areas. My husband and I stayed at the Arenal Lodge with my two young children (4 and 1) and my mother. There were really great trails through the rainforest right behind the rooms we were staying in. I’m glad I found your article! 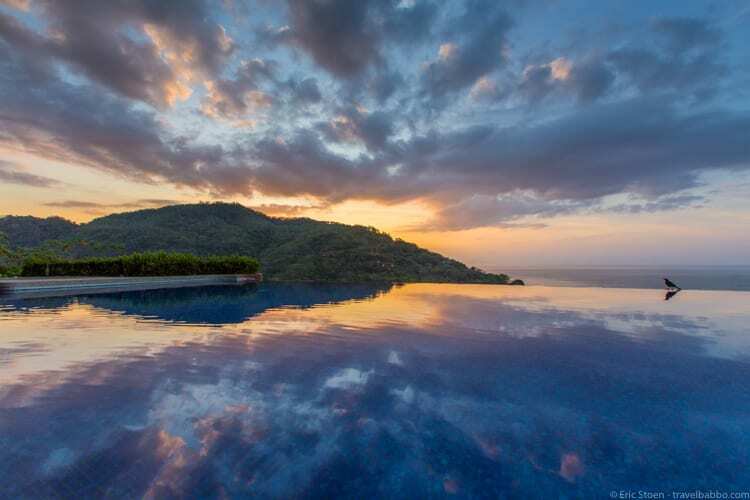 We are heading to Costa Rica in March and can’t decide between the JW Marriott or Hotel Punta Islita. We are concerned about the drive from the airport but it sounds like it was okay? Were there things to do outside of the hotel? The drive was fine. In Chile last year it was four hours each way between the airport and our hotel, and we’ll have the same thing in Ecuador next month, so two hours wasn’t too bad. No, there wasn’t much to do outside the hotel. We walked into town a couple times, but there’s really nothing there. We’d still go back though. There really aren’t any downsides besides the drive. And everyone else who’s given me feedback has loved it as well. Hey Eric, a couple months ago we were trying to decide where to go for Spring Break. I showed Patrick this post about Punta Islita and he said without hesitation, we are going there! Next day he called and booked our reservation. We leave in a few days and are all pretty excited. I called to reserve pick up from airport and they quoted me $45/person for group shuffle or $180 for private. Sounds like a better deal than what you paid. I also called to schedule sunset horseback riding based on your comment that they fill up quickly. The guy said typically they don’t make reservations until guests arrive but was willing to do it for us. Thanks for a wonderfully comprehensive summary of your experiences. Will report back after our trip! Thanks Ting – I love when people take my recommendations, but I always feel pressure too! Hopefully you love it! I had already researched a bunch of places before i remembered to see if you had written anything about place in CR so we won’t hold you personally responsible for our trip 😉. I love that this hotel includes so many of the activities. Loved Punta Islita. Also did a night at the Peace Lodge in the cloud forest – great hotel for kids with attached private zoo but a little Disney-ish. Wondering how you’d compare Punta Islita to Mashpi? Ever been to any other hotels that include activities like this? Punta Islita and Mashpi are fairly different. Punta Islita is really all about the beach, and it includes roughly hour-long activities when you want them. I didn’t feel like we were maxed out on activities though – i.e. scheduling them for every open time slot. At Mashpi, as well as similar properties we’ve stayed at like Tierra Patagonia and Tierra Atacama, you constantly have multi-hour excursions booked, and every day centers around your excursion schedule. Mashpi/Tierra are higher-end properties that include all meals, and they’re at much higher price points. All were amazing experiences, but I don’t know that it would make sense to return to Mashpi or Tierra every year. They’re kind of extraordinary bucket list destinations. I could see returning to Punta Islita often though. It’s more of a standard resort. As to your last question, no – Punta Islita is fairly unique in what they include. If you find others that are in that general price range, please let me know!